There has been much talk about family values in recent years, but little examination of the economic forces that are exploding family life and limiting the caregiving that families can provide. As Folbre points out in her provocative and insightful new book, every society must confront the problem of balancing self-interested pursuits with care for others—including children, the elderly, and the infirm. Historically, most societies enjoyed an increased supply of care by maintaining strict limits on women’s freedom. But as these limits happily and inevitably give way, there are many consequences for those who still need care. 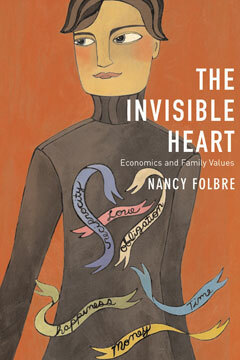 Using the image of “the invisible heart” to evoke the forces of compassion that must temper the forces of self-interest, Folbre argues that if we don’t establish a new set of rules defining our mutual responsibilities for caregiving, the penalties suffered by the needy—our very families—will increase. Intensified economic competition may drive altruism and families out of business. A leading feminist economist, Nancy Folbre writes in a lively, personal style—Molly Ivins cheek-to-cheek with John Kenneth Galbraith—and develops a distinctive approach to the economics of care. Unlike others who praise family values, Folbre acknowledges the complicated relationship between women and altruism. Her book offers new interpretations of such policy issues as welfare reform, school finance, and progressive taxation, and it confronts the challenges of globalization, outlining strategies for developing an economic system that rewards both individual achievement and care for others.